Dozens braved bitter cold temperatures to protest the location of a potential abortion clinic jointly run by UW Health, UW Medical Foundation and Meriter Hospital. The clinic would perform second trimester abortions. There currently are no clinics in the Madison area that offer the later term procedure, something that UW Health claims is an essential public health service. Protestor Peg Gibson, who&apos;s had an abortion, doesn&apos;t agree. "Life is sacred," says Gibson. 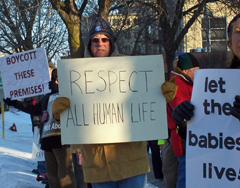 Paul Lagan&apos;s group, Alliance for Life Ministries, has been involved in the pro-life issue for twenty years. He&apos;s calling for a boycott against the parties involved. "The burden is on them to explain to us specifically how they&apos;re going to accommodate those laws prohibiting public funding of abortion," says Sande. Sande is also concerned about a state law that prohibits employers from retaliating against workers who disagree with being connected to abortion procedures. He says it&apos;s essential all workers, including filing clerks and janitors, will be properly protected. A conservative legal group, the Alliance Defense Fund, has requested documents pertaining to the plan. UW Health spokeswoman Lisa Brunette says lawyers for the hospital are confident the plan is legal.